The Confederation of African Football's (Caf) Executive Committee has suspended The Gambia Football Federation from all Caf competitions for two years, for deliberately falsifying players' ages. Last month, The Gambia were disqualified from the qualifiers for the continent's under-20 championship for fielding overage players. Now, The Gambia have been banned from all Caf competitions - including the 2015 Africa Cup of Nations - in line with a clause in Caf's regulations. It states "for any deliberate intention to foul or cheat in any matter involving the falsification of documents, the defaulting association shall be suspended for two years from all Caf competitions." On 20 April, The Gambia were disqualified from the African U-20's Championship for fielding five overage players in the qualifier against Liberia on 6 April. All five players were born in 1994, whilst the rules state that the competition is open to players born on or after 1 January 1995. Caf then launched an investigation into the case of one of those players, Ali Sowe, born in June 1994. He was found to have registered with Caf in 2012 in the Confederation Cup with an identical passport number but a birth date going back to 1988. The Caf President, Issa Hayatou, has reiterated zero tolerance in such cases of age fraud. 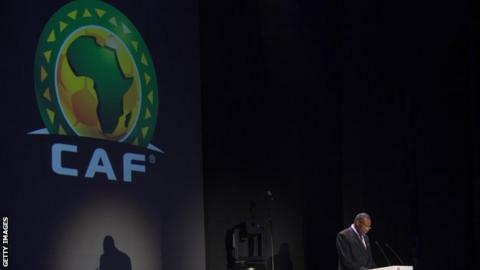 He has urged members of the Caf Executive Committee to continue strict reinforcement to rid African football of practices, which Caf claim "violate ethics and morality." The Gambia's disqualification means that Seychelles automatically go through to the second qualifying round for the 2015 Africa Cup of Nations. Seychelles will meet the winners of the tie between Swaziland and Sierra Leone for the right to join Cameroon, DR Congo and Ivory Coast in Group D of the qualifying group phase. Gambian clubs will also be banned from playing in Caf's continental competitions for two years.